Hey Quizzers and Coaches…here’s all the information you need for this years Bible Quiz Competition. Below are tips, FAQ’s, a sample quize and general rules. Happy quizzing! 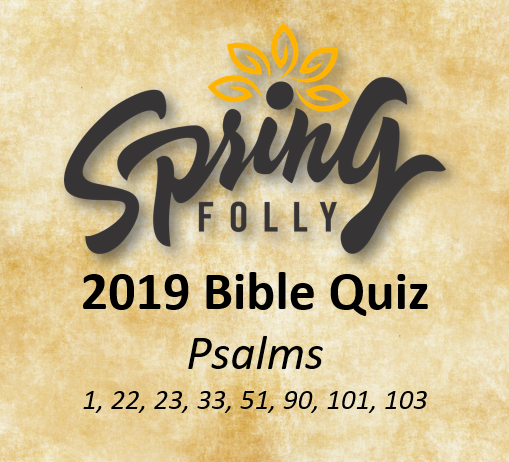 The Scripture section for the Bible Quiz for 2019 is from the book of Psalms – specifically, Psalm 1, 22, 23, 33, 51, 90, 101, and 103. Please note that answers and quotes will be from the English Standard Version (ESV – 2016 onward editions). You can find these Psalms at https://www.biblegateway.com/ which uses the 2016 ESV. All quizzers must be between the ages of 14 and 20 years old and must be registered as attendees of Spring Folly. The quiz team is to be made up only of youth, no youth leaders are permitted on quiz teams. Each year youth groups put together Bible quizzing teams of four, memorize a book of the Bible, and come to SF ready to quiz (Think Jeopardy…without having to answer in the form of a question!). Because this activity takes the most prep, and the most time at the retreat, it also carries the BIGGEST prizes for the winners and runner-ups. If you have questions about the quiz competition itself, please contact the Quizmaster, Rod Marin, directly at the email listed above. When should I start a quiz team? Most quiz teams start in January, but you can start a quiz team at any time prior to the SF entry deadline for Quiz teams. Starting in January gives you lots of time to study the passage, memorize the verses and practice answering quiz questions. Generally, the more practice time the better. However, many teens are notoriously last minute learners and pulling a team together on short notice has been done with success before. The important part of quizzing is engaging your teens in Bible study and memorization while encouraging each other to grow in Christ. Quiz just gives you an outlet and a framework for doing this. What does it mean to be a quiz coach and how do I start? Good teams thrive under good leadership. Being a quiz coach involves recruiting, encouraging and training the teens on your quiz team, and then coaching them through the quiz competition at Spring Folly. @@ Usually a coach is a caring adult who loves Jesus and loves teens. Occasionally teen leaders have chosen to coach a team. Adult Coaches (21 and over) may not be sitting members of the quiz team. Youth Coaches who are not Spring Folly attendants cannot lead or be a part of the quiz team. As a coach start by familiarizing yourself with the portion of Scripture for that year’s quiz and the rules and regulations of the quiz. Then prayerfully look at your youth and start asking, begging & bribing teens to join you as you memorize and study God’s Word. Most teens need a lot of encouragement to make this commitment. Then start meeting regularly with your teens, once a week to memorize, quiz and study together. If you have questions, ask the Spring Folly Quiz Coach for Coaches: Jenn Windle [email protected] or 705-246-7606. She is a 20 yr veteran quiz coach and is happy to help equip you and answer your questions. What are the roles and responsibilities of the coach on the weekend of Spring Folly? Check in your team when you register. Review the schedule for the weekend and know when your team(s) are quizzing. Be there with your team to coach them during quizzes, and offer support and encouragement in between quizzes. Advocate kindly and respectfully for your team with the Quizmaster if needed. The Quizmaster’s decisions are final, but if issues are arising with the team (ie. You think a buzzer may not be working, or a type of question seems unclear…) approach him/her at an appropriate time. What could a typical quiz practice session look like? What components are helpful to include? Typical practice sessions include prayer, recitation of verses, scripture study, and quiz question practice all in a fun and caring atmosphere. Why do we memorize from the ESV translation? The ESV is a solid, reliable, modern English version of the Bible. Because quiz questions use key words or phrases from the Biblical text, and because these words can differ significantly from translation to translation, the Quizmaster bases the questions and required responses on a chosen version of the Bible so that all quizzers are referencing the same text. We don’t have ESV Bibles at our church. What can we do? You can find and print a copy of the chapters you need in the ESV at Bible Gateway @ https://www.biblegateway.com/ . You can find economical copies of the ESV at Scripture Gift and Book Store in Sault Ste. Marie here , or a Christian Book store in your community or online at Christianbook.com if you want to purchase a set. You can also download a free copy of the ESV to your iPod, tablet, or cellphone through the app store (Apple) or the Play Store (Android). Do you recommend the Quizzers memorize or just understand content or both? Both! Memorizing the text gives the brain the best chance to recall information. Studying the text and understanding content equips the teen to apply scripture both in the quiz setting and, more importantly, for life. How do we move the teens from memorizing verses to deeper understanding? Study and understand the text yourself referring to Bible Commentaries, your church leadership and trusted online resources to help you when you don’t understand something. Regularly teach and help teens to understand the words and concepts in the text and apply what you learn together to your lives. Keep the teens on track with memorizing by having them regularly recite what they have learned to you or other team members. Offer rewards or incentives for memorizing. Make up your own set of quiz questions to practice with your team. Have the teens make up questions too. Then practice practice practice. Will quizzers be asked to quote more than one verse at a time word perfect? Though Quote word-perfect questions tend to be just one verse (Eg. Phil 1:6) in sections where the key thought is contained in more than one verse, it is possible that for sake of context the Quiz Master may ask for two or more verses to be quoted. When buzzing in for a “Quote Word-perfect” type question the quizzer must be very careful to listen fully to the Quiz Master to hear the full reference before buzzing in. In a quote word-perfect type question the quizzer may be asked to quote more than one verse especially if the thought or sentence continues over two or more verses. Eg. Quote word-perfect Philippians 1:3-5. Our teens are from different churches/different schools/different towns, what are some ways coaches manage to get a quiz group together to learn and practice? Many teams are in this category. If Sunday school or youth group are not common times for your teens to gather and practice you will need to be flexible and creative. If they don’t go to the same church then meeting at school lunch break or evenings at a church or home may work. If they are from different towns, a road tripping Coach could drive teens to different homes or other meeting places each week. Car rides are great times to connect with teens. Maybe group skype is an option, although nothing beats hanging out together. Find a time and a place that works for all of your team members and then commit to meeting at that time and place. This is really no different then joining any other club or commitment where teens come from a variety of areas. We have too many teens memorizing for a team. Any advice for how to make a team selection? Have the teens who are memorizing the same sections of scripture quiz off against each other. Choose your strongest quizzers for your team. We have a few eager teens wanting to quiz, but don’t have enough teens to form a team. What can we do? First continue to try to rally, beg and bribe any teens you know of to join you. Think outside the box. Offer incentives. Start with friends of those who are interested. If you still don’t have enough teens, contact other youth groups in your area and see if they have teens who would like to join you and make a combined team. If you are only missing one teen and have 3 eager teens, try and recruit a “warm body” teen. One who may join in at the last minute, or who you train to answer simple questions from the text but may not be able to do the work of the other members. This person enables you to have 4 members and gives you the chance to enter a team at SF. Though it is challenging, teams like this have made it to the finals in the past. If you can’t find a warm body, study and quiz together anyway. Bible memorization and small group relationships are gifts that will last a lifetime. 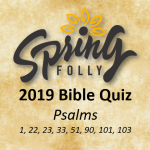 Then come to Spring Folly and enjoy watching some of the quizzes, inviting potential “next year” quizzers from your group to join you. Making up questions to ‘quiz’ the team takes so much time and work. Any advice for the overwhelmed? It does take time and work. But be encouraged, by teaching others God does some of His best stretching and growing in us coaches. Hang in there. Dig into the Word and don’t be discouraged. Set aside 5-10 minutes a day, or a set time each week when you can spend a good hour on making questions. Then make up as many questions as you can in that time-frame. If you make the questions, you reap the rewards of knowing the text inside and out too. Rope in your teens. Teach them how to make questions and then have a few practices where they each take a verse or section and make up the questions. Or, assign question making as homework. Gather the questions and use them. Recruit a godly person(s) from your church who could make up questions. Find quiz questions online. We don’t have buzzers, any advice on how to prepare the teens for ‘buzzing in’? You don’t have to have a buzzer system to prepare the teens for buzzing in. The key to successful “buzzing in” is coaching your team for confidence. Your team could raise their hand, stand up, press a small flashlight or use any other signal to practice “buzzing in.” Sometimes local schools or Reach for the Top clubs may have buzzer systems that you might be able to borrow. Ask around. The quiz team is nervous to quiz in front of people. Any advice to help get them ready for the Spring Folly audience? Find a place for them to practice in front of an audience. Your church family is a great place for this. Approach your church leadership to see if you can use part of a Sunday Service to do a mini-quiz. If you only have one team, invite a team of adults to quiz against you. This is usually a real encouragement to your church and gives the teens a large group audience to practice in front of. If you can’t do it in church, perhaps you could practice in front of the rest of the youth group, or the parents. Any audience will do.